Jean-Michel Bazire trainees finished first, second and fourth in Sunday’s $1,023,349 Prix d’Amerique at Vincennes. He drove Belina Josselyn to victory in a mile rate of 1:55.1 over 1.7 miles. It is the first mare to win the French classic since Moni Maker did it 20 years ago. As HRU discussed earlier this winter, Jean-Michel Bazire and his horses have played in a division higher than most of their opponents in Paris during the stakes meeting at Vincennes. When Belina Josselyn (Love You) put her nose first at the wire in Sunday’s $1,023,349 Prix d’Amérique, it was the culmination of Bazire’s dominance in Paris. 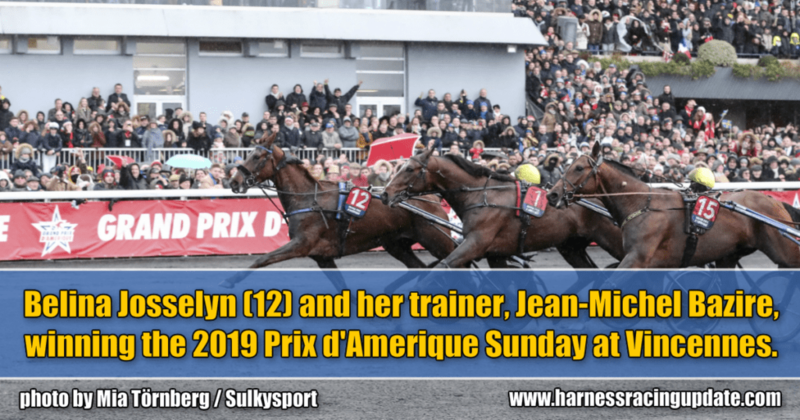 Mia Törnberg / Sulkysport | Belina Josselyn (12) and her trainer, Jean-Michel Bazire, winning the 2019 Prix d’Amerique Sunday at Vincennes. Gerard Forni | Belina Josselyn (with Bazire winning the 2018 Prix de France) is the first mare since Moni Maker to win the Prix d’Amerique. Moni Maker accomplished the feat exactly 20 years ago. Mia Törnberg / Sulkysport | Bazire has dominated the Paris winter meeting and now is Prix d’Amerique champion. 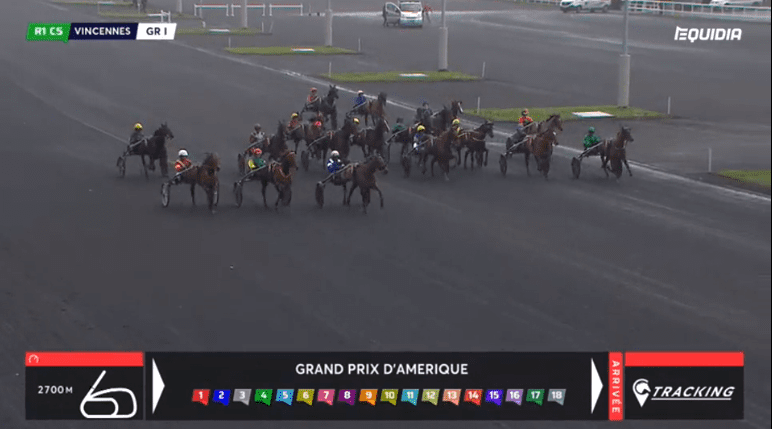 Bazire had three horses in 2019 Prix d’Amérique and it was Davidson du Pont, with driver Franck Ouvrie, that sat in front when the field of 18 trotters left the downhill for the heavy climb back stretch. Davidson du Pont in front, defending champion Readly Express first over and Belina Josselyn second over were the positions for the horses that later would fight for the victory. And then we haven’t mentioned the big upset, Norwegian-bred Looking Superb, who was parked three wide for 1,200 meters before Bazire willingly let his stablemate reach a position in front of him, in second over. Belina Josselyn is the first mare to win the Prix d’Amerique since American-bred Moni Maker did it for Jimmy Takter and — who else? — driver Jean-Michel Bazire, in 1999. What about Bold Eagle and Propulsion then? Well, according to Bold Eagle’s driver Franck Nivard, the start of Prix d’Amérique was a little bit turbulent since he thought that he heard from the starting personnel that a recall was to be announced. That recall never came and Bold Eagle, and Propulsion, never found positions good enough to play a serious role in this year’s race. Despite heavy problems during the race, Propulsion finished strongly to place fifth from eighth over! Bold Eagle was sixth. Meanwhile, the consensus after this year’s Prix d’Amerique is Bazire truly must be some kind of a magic man. The fact that Belina Josselyn won in mile rate of 1:55.1 over 1.7 miles was not a surprise, but the fact that Bazire also trains the runner-up, Looking Superb just adds to the horseman’s legacy. Looking Superb got really close in the end of the race after Alexandre Abrivard made his move three wide at the end of the last turn. Looking Superb’s transformation as a racing horse is unparalleled with anything else in harness racing in Europe at the moment. He won Prix Tenor de Baune and qualified for Prix d’Amérique in late December 2018, and even then the big transformation was ongoing. But to go from there to almost win one of the world’s biggest races is a gigantic step to make. In the hands of Jean-Michel Bazire, Looking Superb is now a horse that could enter several big races in Europe this season due to a terrific performance Sunday that came after a surviving a heavyweight opening with more experienced Readly Express and Belina Josselyn trading punches. Belina Josselyn’s speed in the home stretch was enough to pass her stablemate and Readly Express, but it was tight in the end. Belina Josselyn earned $461,882 for the victory. Fittingly, given the winter meet Bazire has had, he was the winner and Belina Josselyn got her share of luck once more in a prestigious race. Last year, the eight-year-old Love You mare won the Prix de France two weeks after Prix d’Amérique. Early race leader Davidson du Pont held to fourth place and the dominance from Bazire was nearly total. Only Readly Express broke the line between the champion trainer’s horses at the wire. After the race, it was announced that Bird Parker (Ready Cash) raced for the final time in his career. After 21 victories and life earnings of $2,371,799, the Philippe Allaire-trained horse, born in the well-known B-crop in France, concludes a marvelous career on the track.